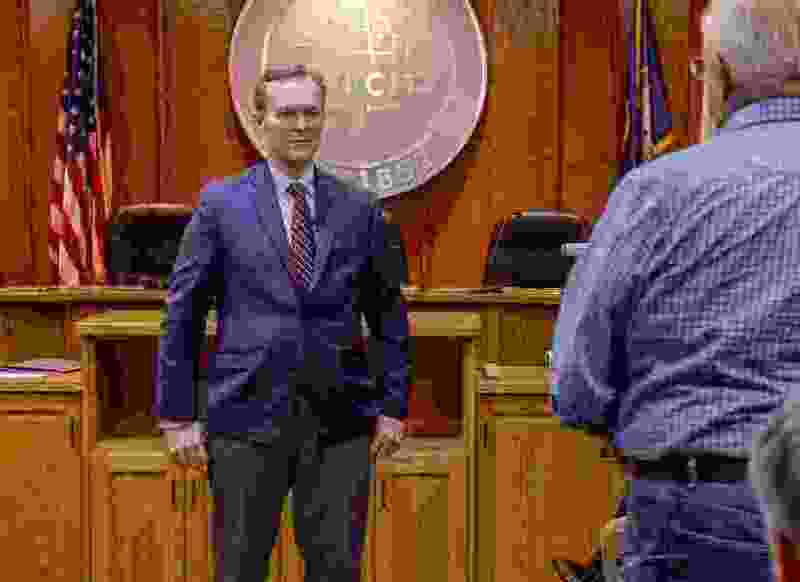 (Leah Hogsten | Tribune file photo) Congressman Ben McAdams is questioned by John Hansen about border security and his stance on abortion during a town hall at the Lehi City Council chambers on Feb. 19, 2019. McAdams is among a group of lawmakers introducing a bill to push a constitutional amendment requiring Congress to make sure federal spending matches revenue every year. They call them balanced-budget bills, but they’re more like cries for help. Freshman Rep. Ben McAdams has joined many others before him, including a couple of Utahns, in introducing a bill to push a constitutional amendment requiring Congress to make sure federal spending matches revenue every year. The national debt was about $5 trillion 20 years ago. Now it’s more than $20 trillion and rising faster than it ever has. Even at today’s low rates, just paying the interest on that debt is a major drag on the economy. If the rates were to climb, it could snuff much of our prosperity. McAdams, who wants to burnish his conservative credentials as a Democrat in a Republican district, made a balanced-budget amendment one of his first bill introductions, joining a coalition of “Blue Dog” Democrats. Sen. Mike Lee years ago made a similar amendment his first bill introduction. Utah’s other freshman, Sen. Mitt Romney, also promised to make the debt a top priority during his campaign. They’re right that their colleagues on Capitol Hill have not been doing their jobs. Raising and allocating taxpayer money is Congress’ core function. The endless string of short-term debt-limit increases make it a core dysfunction. This has been true regardless of which party is in power. Whatever claims Republicans had to fiscal prudence have long been squandered. But preventing Congress from borrowing money could hurt more than help. In past times of war or other economic uncertainty, borrowing over the short term has avoided disaster over the long term. In fact, McAdams’ bill includes several exemptions for such circumstances as a safety valve, but that only makes the amendment that much more unnecessary. If Congress could still pass an unbalanced budget just by claiming one of the exemptions, it becomes one more avenue for avoidance. Congress doesn't need a new law to lower the nation’s debt. It needs courage and resolve. Passing a law to try to force courage and resolve is not courage and resolve. Here’s a better idea for McAdams, Lee and Romney: Tell us where you’d start balancing. Would you raise taxes, lower spending, or both? Please include specifics. Health care? The political fight is still over Obamacare, but the big prize is cost control. Health care consumes roughly a quarter of the nation’s GDP and growing. How can Congress make health care more affordable to make it more accessible? Social Security and Medicare? The key to heading off long-term insolvency is early intervention. We’ve already let these go on too long, but addressing them soon will require smaller nudges that waiting 10 years. Defense? We spend five times more than China and six times more than Russia, and it’s not clear we’re making the right choices to face 21st century enemies. Weapons procurement is driven as much by defense contractors delivering manufacturing jobs to congressional districts as it is military need. The challenges are immense, and give McAdams, Lee and Romney credit for recognizing the importance. How we tax and spend says everything about who we are and where our priorities lie. But Congress doesn’t need an amendment. It needs members who will face their fears.